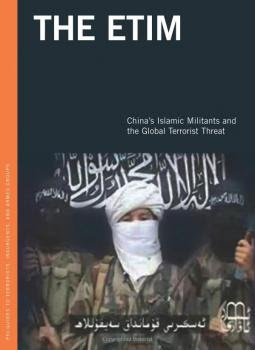 Leaders from "East Turkestan" terror organizations have organized for members to head for Syria to participate in their quest for jihad, the Global Times has learned from Chinese anti-terrorism authorities. The organizations include the East Turkestan Islamic Movement (ETIM) and the East Turkestan Education and Solidarity Association (ETESA) that push for "independence" for China's Xinjiang Uyghur Autonomous Region. 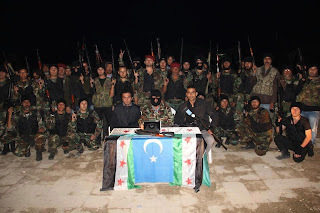 Since May, ETIM and ETESA members have been going to Syria and linking up with organizations like Al Qaeda to fight against the Syrian government, according to China's anti-terrorism authority. The headquarters of ETESA, located in Istanbul, are quite extensive and include research, media, social affairs, education and women's affairs departments. It aims to "educate and train Muslims" in Xinjiang and "set them free" by forming a Muslim state, according to a second official. In 2011, after graduating from university in Urumqi, Memeti Aili went to study in Turkey like many other Muslim Uyghur students. Soon after settling down in Istanbul, someone from the ETESA approached and offered him "help". A year later, after studying the lessons they provided, Memeti Aili was informed by ETESA and ETIM that he had been selected to travel to Syria to join the fighting. Together with other young people, Memeti Alili travelled to Aleppo, the largest city located in northwestern Syria and arranged to join the rebels. The percentage of foreign fighters in Syria has reached up to 80 percent from 29 countries such as Libya, Turkey, Lebanon and Yemen, according to Omran Zoubi, Minister of Information in the Assad government. 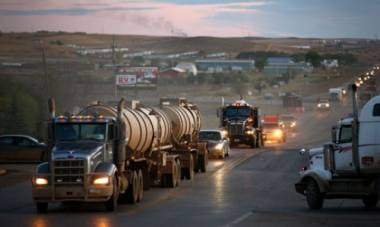 Global Times: There have been reports about terrorists from Xinjiang joining the conflict in Syria. Can you confirm that report? Imad Moustapha: Our estimate is that there are around 30 Chinese involved. Our informant told us around 30 young Uyghur men went to Pakistan to receive military training and then went to Turkey. We believe the reason they went to Turkey after training in Pakistan is to go to Syria. Most probably, they are now fighting in the northern city of Aleppo but we're not sure about this. What we know for sure is they were trained in Pakistan and then traveled to Turkey. Our informant who is based in one military camp in Pakistan told us there are 30 of them, but that doesn't mean there are not more of them. "He has opened several Islamic universities in the United States. As I said it's being promoted under Moderate Islam. It is supported by certain U.S. authorities here because of the operations in Central Asia, but what they have been doing since late 1990s is actually radical Islam and militizing (phonetic) these very, very young, from the age 14, 15, by commandoes they use, and this is both commandoes from Turkish military, commandoes from Pakistani ISI in Central Asia and Azerbaijan, and after that they bring them to Turkey, and from Turkey they send them through Europe, to European and elsewhere." Wang Yi said China appreciated Turkey’s support on issues concerning China’s major core interests, and would like to strengthen cooperation, as well as communication on international issues. He said the recent terror attacks in China’s Xinjiang Uygur Autonomous Region were carried out by criminals connected with overseas terrorist organizations. Wang stressed that the attacks have brought severe harm to the people who live in Xinjiang. The Chinese government, Wang added, will firmly crack down on violent terrorist crimes. Turkey’s Foreign Minister Davutoglu said his country hoped to boost strategic cooperation with China at the bilateral, regional and international level. He said Turkey opposed terrorism in all forms. It is difficult to say what Davutoglu wants to tell us with this statement but maybe he is just trying to start his career as a comedian. Hua noted that the so-called "East Turkistan" forces represent "three evil forces" of terrorism, separatism and extremism that have resulted in multiple terrorist attacks in Xinjiang in recent years, incurring large civilian casualties and threatening national security. The "East Turkistan" secessionism and terrorism forces are linked to other international terrorist organizations, which have posed threats not only to China, but to the peace and stability of other countries in the region, she said. Beijing sent paramilitary police into the streets this weekend and dispatched its top law enforcement official to the northwestern province of Xinjiang in a high-profile show of force after a week when at least 35 people died in the worst sectarian violence since large-scale unrest in 2009. At a gathering for mobilizing anti-terror efforts held in Urumqi, capital of the autonomous region, Meng said the armed police should cooperate with local public security organs to take preventive measures, and carry out 24-hour patrol on all weather conditions to protect the safety of the public. Police authorities in Xinjiang Uygur autonomous region announced it would reward whistleblowers who expose terrorist plots, a move to help rebuild stability after a recent deadly terrorist attack. The Public Security Department of the Xinjiang Uyghur Autonomous Region on Tuesday issued a wanted list for 11 suspects of old attack cases dating back to 2011 and a circular on seizing controlled knives, explosives and banned propaganda on terrorism. A citizen of Turkmenistan turned out to be the commander of the suicide bombers' unit of Al-Qaeda in Aleppo, Syria. He was detained along with his followers during the North Storm operation, Vesti.ru portal reported. Meanwhile, Fergana’s editorial office continues receiving information on “Turkmen jamaats” - radical Islamist communities - in Afghanistan. 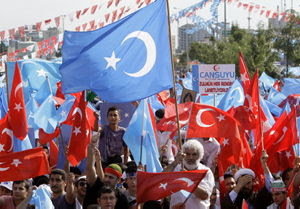 However, no connection between them and the “Syrian” Turkmen was established. The Kazakh government has taken the threat of radical religious movements seriously in the past two years, during which there were seven major terrorist actions in the country, with dozens killed and even more wounded, the Jamestown Foundation reports. There are now more than 200 Islamic radicals in Kazakhstan, Kazakhstan officials state. These cells include domestic-based ones and external-based ones like the Islamic Movement of Uzbekistan, al Qaeda, the Islamic Movement of Eastern Turkestan, the Muslim Brotherhood, the Taliban, and the Mujahidin of Central Asia. Russia and its allies will strengthen the military group in Central Asia and specifically in the Ferghana Valley frequently penetrated by Talibs from Afghanistan, reports Nezavisimaya Gazeta. Russian Foreign Minister Sergei Lavrov is convinced that "... with ISAF contingents gone [from Afghanistan, danger ought to be expected from Uzbek and Tajik ethnic groups." Alexander Knyazev of the Institute of Oriental Studies of the Russian Academy of Sciences once said that "... both drugs and gunmen make it into the Central Asian region... via Tajikistan and Kyrgyzstan." As far as Knyazev is concerned, the Uzbek ethnic groups Lavrov mentioned mostly comprised citizens of Kyrgyzstan and Kyrgyz Uzbeks. Leader of the banned Salafiya group in Tajikistan, Sirojiddin Abdurahmonov (also known as Eshoni Sirojiddin) has been released from prison after serving jail term for inciting national racial, regional or religious enmity. According to experts, there are estimated to be several thousand followers of Salafism in Tajikistan, mostly young people aged 20 to 30 and many of whom graduated from Islamic schools in Pakistan or Arab countries. The situation in Afghanistan is so tense that it may echo in neighbouring Tajikistan, Kosimshokh Bekmuhammed, a Tajik scholar of Afghanistan, told Central Asia Online. "Eleven villages in Badakhshan Province, Afghanistan, [that fell into militant hands] have reportedly been re-taken by the government, which doesn't mean, however, that the fighters have hung out the white flag," he said. "Moreover, that they surrendered those settlements doesn't mean that all of them have gone to central Afghanistan; as a rule, some small groups go north – that is, to Tajikistan. But Tajik law enforcement stands ready for any scenario, Kodyrkhon V. said. So what could possibly go wrong? !